Freemasonry bears the imprint of the society in which it exists, and Freemasonry in North America is no exception. While keeping close ties to French lodges until 1913, American Freemasonry was also deeply influenced by the experiences of many early American political leaders, leading to distinctive differences from European lodges. 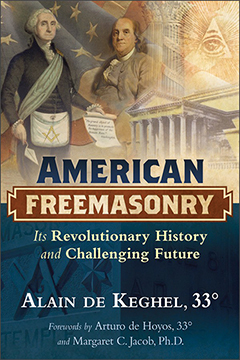 Offering an unobstructed view of the American system and its strengths and failings, Alain de Keghel, an elder of the Grand Orient de France and, since 1999, a lifetime member of the Scottish Rite Research Society (Southern U.S. jurisdiction), examines the history of Freemasonry in the United States from the colonial era to the Revolutionary War to the rise of the Scottish branch onward. He reveals the special relationship between the French Masonic hero, the Marquis de Lafayette, and the Founding Fathers, especially George Washington and Benjamin Franklin, including French Freemasonry’s role in the American Revolution. He also explores Franklin’s Masonic membership, including how he was Elder of the lodge of the Nine Sisters in Paris. The author investigates the racial split in American Freemasonry between black lodges and white and how, unlike in French lodges, women are ineligible to become Masons in the U.S. He examines how American Freemasonry has remained deeply religious across the centuries but forbids discussion of religious or social issues in its lodges, unlike some branches of French Freemasonry, which removed belief in God as a prerequisite for membership in 1877 and whose lodges operate in some respects as philosophical debating societies. Revealing the factors that have resulted in shrinking Masonic enrollment in America, the author explores the revitalization work done by the Grand Lodge of California and sounds the call to make Freemasonry and its principles relevant to America once again. Includes an 8-page color insert. October publication. Pre-Order Now! AMERICAN FREEMASONRY: Its Revolutionary History and Challenging Future By Alain De Keghel, 33˚. 216 Pages. 6x9 Hardback. Illustrated.